A BOY from Henley was thrilled when All Blacks star Sonny Bill Williams gave him his shorts and socks. Luca Coleman caught up with the New Zealand centre moments after his team had beaten the British and Irish Lions in the first test match. The nine-year-old Lions fan was at the game in Auckland with his family with whom he is on a six-month world tour. He was caught on live TV asking the Kiwi player for his shirt but Williams was wearing an orange training top rather than the iconic black shirt so he whipped off his shorts and socks and gave them to Luca instead. 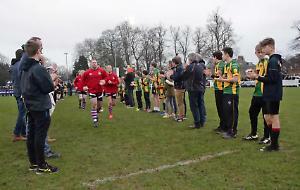 The mementos helped the Coleman family, of Hamilton Avenue, Henley, get over the disappoinment of the Lions’ 30-15 defeat by the hosts at the Eden Park stadium. A week later, the tourists turned the tables on the All Blacks, winning 24-21 in Wellington and Williams was sent off for foul play, meaning he will miss the deciding test back in Auckland tomorrow (Saturday). Luca’s father Paul, a retired sports marketing company owner, said: “Luca cheekily asked Sonny Bill for his shirt which he wasn’t able to give him so he very generously gave up his match shorts and socks. “To top it off, Ken Owens, a British Lion who we have got to know through following the tour, also gave us his shorts and socks so we have a pair from each team. Mr Coleman, 51, said the family had “stalked” the Lions team during their tour of New Zealand and met players including tour captain Sam Warburton. “The kids have had their jerseys signed by almost every player plus many All Blacks,” he said. Mr Coleman and his wife Jude, 48, a doctor, decided to take their children, Luca and four-year-old twins Dylan and Izzy, on a long holiday so they could experience more of the world. This meant taking them out of Trinity Primary School in Vicarage Road. The family had already spent three months travelling to countries including Argentina, Brazil, Costa Rica and Peru before arriving in New Zealand in May. Mr Coleman said: “We wanted to take the trip to give our children a different perspective on life and for them to see a diverse range of cultures and experience situations they wouldn’t get at home. “Although I have visited close to 100 countries, I didn’t get the opportunity to go overseas until I was a teenager so I wanted the children to have some early opportunities to travel. “Jude and I believe travel has had a deep impact on shaping the people we are and giving us the confidence to try different things and be accepting and empathetic to different cultures. “We feel that our children are at an age where their school education will not be impacted but, in fact, enhanced. Our children have a lovely life at home but we also wanted to expose them to less privileged environments. Luca is keen on sport, playing rugby for Henley Hawks and football for AFC Henley. He is also a talented skier who trains with the British Ski Academy and won a race for his team, Team Breckenridge, in Colorado at the start of their trip. Mr Coleman arranged for his son to train with High School Old Boys in Christchurch, the former club of New Zealand legend Dan Carter, during their trip. Luca also spent a week playing football at Argentinos Juniors Academy, Diego Maradona’s former football club in Buenos Aires, and he was featured in the club’s promotional video. The family also took part in a world record attempt for the most people to take part in the All Blacks’ haka in Rotorua. Mr Coleman said: “We wanted to immerse Luca in a variety of sports early in his life because it’s easy to absorb the benefits and skills. “I have always had an involvement in sport. I initially played rugby but then did multiple Ironman triathlon events before going to work in the sport. “I am a qualified rugby coach, ski coach and triathlon coach and an advanced diver. “I was also a crew member for a leg of the Global Challenge round the world yacht race which we won. “My wife has done Ironman events and multiple marathons so we are a pretty sporty bunch!” The family will continue to travel, visiting Fiji, Singapore and Bali before returning to Henley at the end of August. Mr Coleman said: “We have had an absolutely fantastic experience in New Zealand and the events at the first test match made things even more special for us. “It has always been a goal of mine to follow the Lions on tour as it’s unique and exceptional. “We love the blend of players and fans from different countries together. It has been a wonderful experience.